Sweet Floweret: Sweet Monday Giveaway-Maple Sugar Lane Item of Choice! Sweet Monday Giveaway-Maple Sugar Lane Item of Choice! This week the giveaway is from one of my favorite etsy shops, Maple Sugar Lane. I talked about Maple Sugar Lane here on this "Fab Find Friday" post when I ordered a bunch of stuff for my girl before school started. Oh. My. Goodness. Cutest thing ever. Love the flower but also the cool headband! So into grey right now. Might need to nab this for myself. What's Jaime giving away? Any item of the winner's choice! Guess what? Jaime is giving 10% off to all facebook friends. Just use code "BLOGGY" upon checkout! Maroon, Brown, Mustard Yellow & Cream Wool Felt Flower Headband. I like the pink butterfly headband. Beautiful. there are so many cute things it's hard to choose! i do love the grey flower headband or one of the belts...everything is great! I have been following MSL ever since your Fab Friday Find post. Her stuff is.over.the.top.adorbs! I think I would have to close my eyes and take a blind pick if I were to win. I love soooo many of her items. 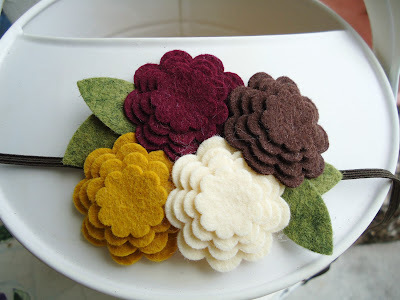 I particularly love the look of the felt flowers with fall in full swing and the cold winter months fast approaching. I just ordered from her too!!!! Love her things! okay, SO cute! I think this shop will also be passed on to Grandma with Christmas coming - hehe! Love so many things, but right now I'm a little partial to the white felt flower on soft tan stretch band . . . but then again I just discovered barrettes will stay in Anna's hair . . .so many choices! Definitely added my "like" to them on Facebook. By the way, is it too late to enter? I regret I missed this post yesterday! Okay, I liked Maple Sugar Lane on FB. I like everything she makes! But if you're making me choose, I love the Brown headband with felt fall color flowers on the 1st page. I would wear that all the time. I would choose the yellow, blue, and white felt flower head band! I just ordered a bunch of clips for the girls. I also asked if she could one of the headbands so that the girls could wear it with their uniform - so excited! I love the fall colors! Such cute stuff! I'd love the brown headband! Super super cute! I love the 3d headbands and I'm excited to be following her on FB! Oh boy, that blue headband with the triple pearl felt flowers would just match a dress I ordered for my daughter. :) So many pretty, pretty things!